St Mary's Episcopal Cathedral lies towards the western end of Edinburgh's New Town. 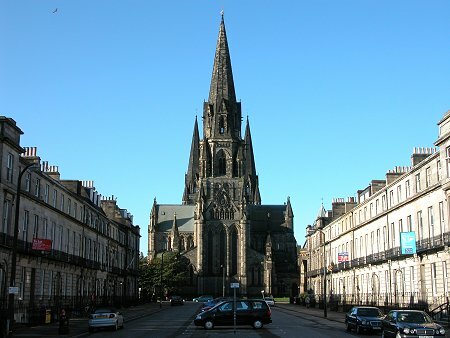 It was built from 1873 to seat 1500 people and the central spire reaches a height of 270ft. 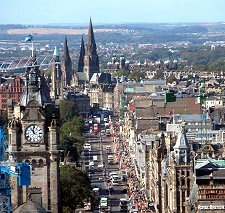 With two further, smaller, spires, St Mary's distinctive outline dominates distant views of the west side of the city centre. Yet paradoxically it is much less visible from the surroundings streets of the New Town, with only the view along Melville street doing it any justice at all. The Scottish Episcopal Church had its origins in 1582 when the national Church of Scotland rejected government by bishops (episcopal government) in favour of government by elders (presbyterian government). This was no minor matter in the 1600s when James VI/I and Charles I tried to enforce rule by bishops on the Church of Scotland (thus bringing it into line with the Church of England), resulting directly in the two "Bishops' Wars" between England and Scotland, effectively the opening act of the 20-year Wars of the Three Kingdoms that included the English Civil War and the Cromwellian occupation of Scotland that followed. Following the Restoration of the Monarchy in 1660, Charles II tried again to impose bishops on Scotland. After James VII/II. was deposed (largely because of his Catholicism) by William and Mary in 1689, the Church of Scotland was allowed to become fully presbyterian, and the displaced bishops refused to recognise the new regime, supporting instead the "legitimate" (albeit Catholic) King James VII/II, giving it a common cause with the Jacobites who sought to retake the throne on a number of occasions until 1745. 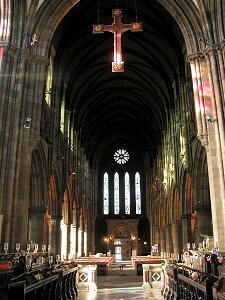 Over time, the Scottish Epsicopal Church freed itself of its Jacobite overtones and became a separate church, part of the world-wide Anglican Communion. 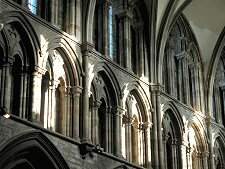 St Giles' Cathedral in Edinburgh was controlled by the established Presbyterian Church, leaving the Episcopalians without a cathedral. This gap was filled first by a woollen mill, then by a series of churches used as pro-cathedrals. In the mid 1800s Barbara and Mary Walker, the unmarried daughters of Sir Patrick Walker, bequeathed their entire fortune to the Episcopalian Church on condition a cathedral was built on this site. This bequest took effect with the death of the second sister, Mary, in 1870. Their Trustees invited six architects to submit designs for what would become the largest church built in Scotland since the Reformation. A design with three spires submitted by Alexander Ross received much public support. But the decision went in favour of one of three designs submitted by Sir George Gilbert Scott, for a church with a single central tower and spire. The price was agreed at £89,770 and construction began in May 1874. 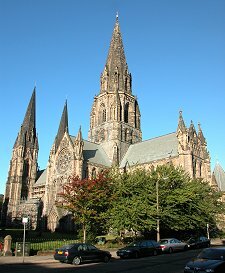 But the trustees quickly had second thoughts about the merits of one spire versus three and asked Scott to vary his design so a further two spires could later be added to it. The church except for the chapter house was completed in 1879, for a price of £110,000. 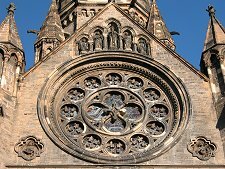 It was consecrated on 29 October 1879 and daily services have been held ever since. One of Scott's sons built the missing chapter house to his design in 1890-1 for a further £5,000. And another son completed the two western spires, to Scott's amended design, between 1913 and 1917 for a price of £13,200. Sir George Gilbert Scott's approach was fairly conservative, though the internal diagonal buttresses supporting the tower were highly innovative. The design borrowed heavily from the detail of Scottish medieval abbeys. The result is magnificently ornate, a glimpse of how much was lost to us as a result of invading English armies in the 1540s and the Reformation. The exterior of the south transept is typical. A wonderfully carved doorway leads up to three lancet windows, above which is a large rose window. This in turn is surmounted by five statues in niches, and this whole face of the cathedral is a riot of ornamented pinnacles. The interior is spacious and full of beautiful detail. Catch it on the sort of day shown on this page and the effect is simply wonderful. 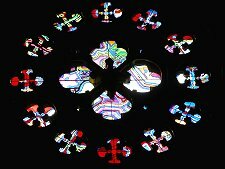 The stained glass windows on the south side of the cathedral dapple much of the interior in coloured light. The effect is especially striking if the hanging rood is illuminated by the windows. This suspended cross marks the division between nave and choir. The focus of the whole church is the high altar. Framed and backlit by the stained glass windows in the east end of the cathedral. The workmanship is superb and the symbology ranges from the fossils in the granite of the steps through to the Verona and Carrera marble used in the decorative reredos, the sculptured screen behind and above the altar. 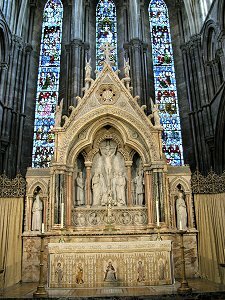 The Statues in the niches are of St Margaret of Scotland and St Columba.